The Geek and The Belle: GIVEAWAY MONDAY!!!! CONTEST HAS NOW ENDED. WINNER WILL BE ANNOUNCED IN THE MORNING. Thanks to all of you who entered. I appreciate all of you making this a success. I will be having more giveways in the future! I was recently contacted about doing a giveaway on my site. Let me tell you, I had so much fun looking around their site. They have over 200 different stores for you to choose from. From cookware to kids bedding . Both of my daughters are wanting to redo their bedrooms. They found the perfect bedding for their rooms. If you have boys, they have a large selection of sport team bedding, even college teams are on there. 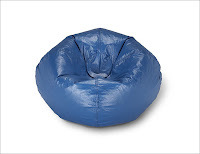 This is the X Rocker Standard Blue Shiny Bean Bag Chair. I loved my bean bag chair as a kid. They are great from little kids to teens to relax in while watching tv or playing a video game. To enter all you need to do is visit http://www.allchildrensfurniture.com/ and tell me what your favorite item is. For extra entries you can follow this blog and follow me on twitter. Just make sure you do a separate comment for each thing you do. One for your favorite item, another for following the blog and another for being a twitter follower. So 3 comments total. Bacati Sunshine in Bright Colors Bedding is my favorite! I love the Bacati Valley of flowers kids set , but you know what? I have 6 boys and I don't think they would like it , but mama does! I already have you in my favorites list. Would love to win the beanbag. We need it! Cane and Jordan fight over Canes because the cat *ee*eed on Jordans and we threw it out. Ok, I love that bean bag but I am not participating in this giveaway because a) I am on another continent and b) I don't have children. So, let me not be greedy! But that bean bag would be so great.. I like the Area Blocks Vanilla Youth Bedding Set. such pretty rich colors. Wow they have a great selection of arts and crafts, and the prices seem pretty reasonable. I would probably try the mud puppy products, they look really fun. I like the big pool duvet set. I love the art section! I would have to pick the friendship stamp set! I would love to get the little miss liberty scallop desk for my favorite little one! I love Alligator Treasures Three Drawer Dresser because it would work (repainted) as a nice little piece of furniture or keep it as it is for the kids! I don't have kids, so I like it for the shape and practicality anywhere in the house. I love all the Kidcraft Kitchen sets- they are so cute! Sorelle Ameilia Elite Convertible Crib is my fave.